Two “asthma babies”, as I’ve always called my sons when they have colds, have me working to keep their sniffles from developing into chest congestion that will include late nights with the nebulizer, trips to the doctor, and just plain misery. I’m not a doctor or herbalist, but I’ve learned over the decade since they were first diagnosed with asthma what helps my sons feel better and keeps things flowing, if you know what I mean. Keeping them hydrated with lots of water laced with elderberry syrup seems to be the key to keeping secretions thinned and infections from developing when they catch a cold. “What color is it” is something they frequently hear from me after a nasty coughing bout. And I’ve learned from watching my husband suffer on three different occasions over the years from pneumonia that mucus is good, as long as it’s coming up, and color is so important. I know. Horrible subject. Especially on a food blog. 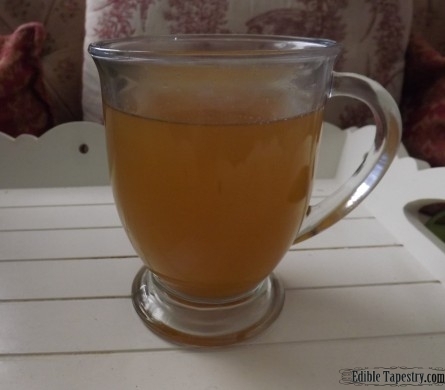 But as I poured cups of tea for my sons this morning, which seems to act as a great expectorant, and made sure everyone was comfortable, I decided to share my recipe on the blog. The ingredients in my decongestant tea* don’t just make them feel better and open their sinuses right up, but are purported to be healing and beneficial. Readers should do their own research, however, to decide for themselves if brewing up a batch of my spicy, aromatic chai is a good idea the next time a sniffle hits. I, on the other hand, drink it any time because it’s lemony and exotic and just plain good! 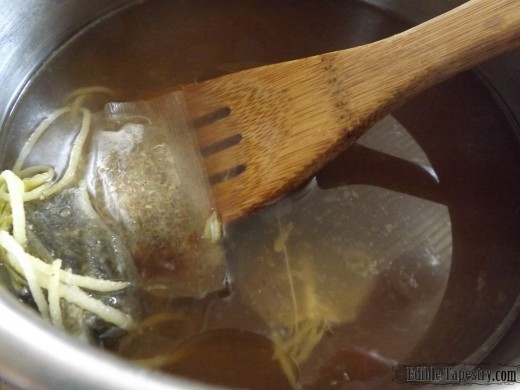 2 chamomile tea bags. I use Celestial Seasonings brand. The contents of 3 fenugreek tablets. I use Spring Valley brand. Raw sugar, maple syrup, or honey to sweeten to taste. Steep all of the ingredients in the boiling water until cool enough to drink. *The information provided in this blog post is not intended as a recommendation for the treatment of any ailment or to diagnose an illness. I am not a doctor or health practitioner, but am simply sharing a concoction of natural ingredients that I personally use, with ingredients I have researched for myself and my family. Anyone can have an allergic reaction to any food or herb so care in use of all ingredients should be taken into consideration. This information is not intended as medical advice.